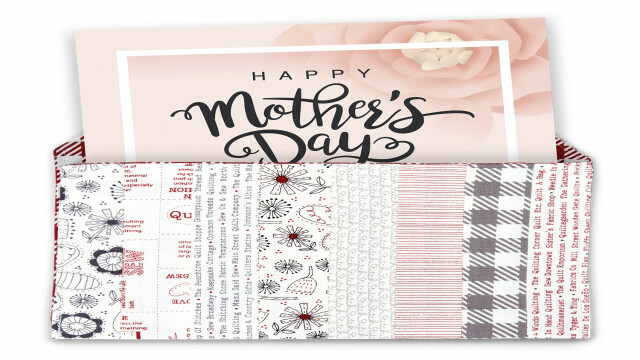 Make a fabric card envelope for mom out of eight coordinating fat quarter fabrics. 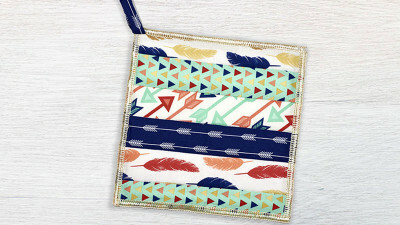 She'll love the homemade touch of this envelope! Using a red, white and black color scheme, we made this unique and easily personalized envelope to hold a card and can be recycled to carry coupons or notes. 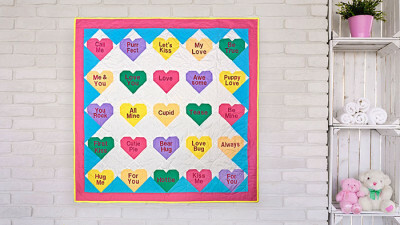 This quick and easy sewing and quilting project can be made and adapted for a birthday, Valentine’s Day, sympathy, congratulations, birth or any other occasion for a loved one! Download printable instructions here. Cut one 1.5 inch x 12 inch strip for a total of 8 strips. From the stabilizer, cut one section that measures 8 ½” x 12” for the interfacing. Cut one section 8.5 inch x 12 inch for the interior of the envelope. 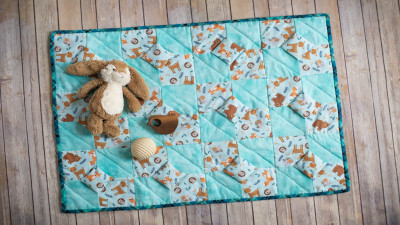 Arrange all eight strips side-by-side in the order that they will be pieced together. With the machine set up for sewing, sew a ¼-inch seam allowance along the long edges to piece the units together. Fuse the stabilizer to the backside of the unit. Trim the section to 8.5 inches x 12 inches. To create the flap on the envelope, take the inside rectangle section and the pieced sections and mark 2 inches from each of the corners as shown in the following illustration. Line up the ruler on the two marks and cut to remove the corner. You will have an angled corner. Repeat for the opposite corner. Then repeat for the pieced section. With the right sides together, pin both sections together. Stitch around the outer edge leaving a 3-inch opening on one of the sides for turning. Clip the corners and turn right side out. Press well and top-stitch 1/8 inches from the edge around the entire envelope section. Place the section with the pieced side face-down on a flat surface. Fold the bottom edge of the section 4.5 inches upward over itself to form the pocket. Pin the section in place. Top stitch along both sides to form the envelope. Fold the top flap over the envelope and press in place. Insert your Mother’s Day card and give to mom on her special day. She can reuse it to hold coupons, notes and photos!